– Your Highness! Stop! Please! – the old court master was begging the girl who was running as fast as she could. Her two court ladies were running after her, a younger one and the older, but the girl was already far away. The court master and the ladies-in-waiting looked at each other and he signaled them with his eyes which meant: no one should ever know about this incident! The two ladies quietly left the room and the court master held his beard with one hand and he put his other one on the handle of his sword that was hanging from his belt and started thinking about what excuse he is going to come up with to the girls father, the tribe’s King, if he finds out that his daughter ran away again. The girl’s name was Dora and she was the oldest daughter of the Aztec tribal chief Tacochepachopu and his beloved wife. Although Dora went to school with the rest of the girls. 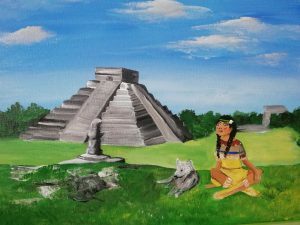 She frequently protested that she wasn’t interested in domestic science and the family preparation classes and that she would rather attend the boys’ school and learn about Astronomy and Martial arts, but it wasn’t possible because the Aztec schools were strictly divided for boys and girls! And when the chief would hear about Dora’s mischiefs he often cried out: this child should’ve been born a boy! I would have a powerful heir! – knowing about her restless character, but then he’d think: but who would tame him then? Today the chief Tacochepachopua was standing in the field in front of the pyramid and watching his warriors and how their gold-plated shields and spears shone under the sun. it was a sight that filled his heart with pride. Then suddenly, something disturbed the lines of soldiers and the chief noticed a small dog that belonged to his daughter, his personal bed-warmer. Soon after the chihuahua, Dora ran out to the clearing followed by the court master and those two dames, her teachers. Tachochepachopua was deeply moved: his invincible army and the mistress of his heart, his daughter Dora and her dog. “so she ran away again” – the chief thought. Dora pretended she only followed the dog, but she went to hug her dad anyway, pretending to have only noticed him just now. – Dora sweety, what’s going on? There is no school again? – Taccochepachopua joked. – there is, but Bibo ran away so I had to go get him. – and what is he doing in your classroom, Dora? – He was my feet-warmer. You know dad, the classrooms in that pyramid are cold. Taccochepacopua smiled, caressed her hair and gave her a hug. He gave a sign to the court master who came to tell him something, that it is not important and to remain quiet. The court master sighed with relief knowing that his excuses are lame and see-through and that he only comes out stupid before the chief because he knew his daughter well. Later in the evening, Dora’s parents talked about their daughter. – Taco, this makes no sense… a school for girls isn’t the right place for her – mom said. Dora was eavesdropping behind the entrance and thought: the rules are stupid, we should change them! – You know those stories that women are queens and leaders in some cultures and that they can do everything like men? – mother asked. – …of royal descent – the chief added pensatively. – I saw that – Taccochepachopua smiled – once I observed her while playing. Having heard that, Dora burst into the room and jumped on her dad from sheer joy. – thank you, daddy! – and hugged his dad whose mood changed instantly. – My dear Dora, we’ll have to come up for something for you and girls alike. – does it mean we will be able to study Astronomy and Martial Arts? – Yes, but together with housekeeping, of course. I want you to become a complete person and a warrior, more capable than your male colleagues. – Oh, daddy, thank you! – Dora firmly hugged her father.